While recently working at my desk at the Scully Mansion I took a momentary break from reading about water quality issues, to turn around to gaze from the 2nd floor window to see if anything was happening outside. Well, my timing was perfect as robins were what was “happening”, big time in fact, as there were lots of them in nearby trees. I quickly counted 16 birds in one tree flitting around its top half and six more birds in an adjacent tree. Intrigued by the concentration, I went outside to better understand what they were doing and what was attracting them. As I get closer I realized the tree was a fruiting American holly and the robins were feeding on the abundance of bright red holly berries available. American Holly (Ilex opaca) is the most well-known member of the holly family on Long Island and one of our more distinctive native trees. Its leaves are unique, rigid with spines, and their dark green color gives rise to the Latin species name of opaca. Their flowers are whitish-green and are as inconspicuous as the berries are conspicuous. 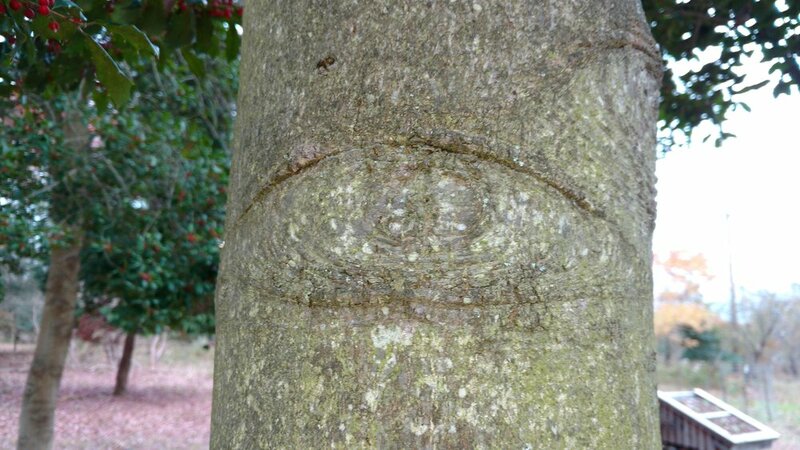 The tannish smooth-skin bark has distinctive “eyes”, locations where branches once grew. This is the tree - with its attractive contrasting colors of red and green – that’s seasonally associated with our holiday season. If you pay closer attention, you’ll soon realize that not all American Hollies display bright red berries. Some trees have an abundance of berries while others have none. How to explain this floral mystery? Easy answer: the former are female trees while the latter ones are males, a not surprising fact once you know that all hollies are dioecious, meaning that any single tree has only male or female flowers and not both on the same tree. This trait is fairly uncommon in the plant world (Asparagus is another example); more common are monoecious trees of which oaks, hickories, and maples are a few examples, in which trees possess both female and male flowers on the same tree. And to complicate things a bit further: among plant species in the Rose family you have what are known as “perfect” flowers in which male parts (stamens) and female parts (pistils and ovaries) not only occur on the same plant but on the same flower. American Holly (Ilex opaca) is uncommon but widely distributed on Long Island but two places standout if you want to see a holly forest: the maritime holly forest situated in the Sunken Forest at the Fire Island National Seashore and the forests on the north side of the road in Montauk State Park (quite viewable along the trail that takes you out to the viewing blind overlooking the popular seal haul-out site located in the northwestern corner of the park). In the Sunken Forest, the unique forest that grows between the holly co-dominates the forest with shadbush and sassafras. It is a very rare type of forest known from very few locations, being ranked by the New York Natural Heritage Program as both an S1 and G1 community, in the state and world, respectively. Another fine example of a maritime holly forest is a two hour ride from western Long Island: the holly forests at Sandy Hook, New Jersey, part of the Gateway National Recreation Area. Inkberry (Ilex glabra), is an attractive native shrub that is a member of the holly family; it is widespread throughout Long Island, being especially abundant in low-lying areas in the Pine Barrens. A particularly large stand of Inkberry is found along the Paumanok Path as it passes just north of Owl Pond in the Birch Creek/Owl Pond section of the Pine Barrens. Inkberry is a classic “coastal plain” species and, not surprisingly, its distribution in New York State is restricted to Long Island. It prefers sandy soils where the water table is shallow, i.e. not far below the surface. It is not typically found growing in standing water but right alongside wet areas where the roots can easily access moisture. The species name refers to the glabrous or very smooth nature of the attractive green foliage of the plant- hairy it is not! The common name refers, of course, to the dark blue berries that stain your fingers an inky-purple if you crush them. The winterberries from the third group of holly members on Long Island and unlike the prior two groups are not evergreen, dropping their leaves each autumn. 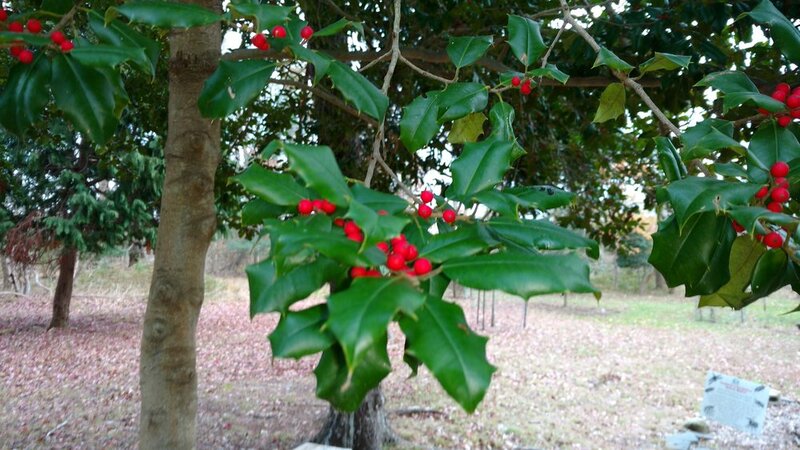 But they’re holly members, nevertheless, as can be seen by a glance at the bright red berries. Smooth Winterberry (Ilex laevigata) and Common Winterberry (Ilex verticillata) are the two more common species; Mountain Holly (Ilex mucronata) and Mountain Winterberry (Ilex montana) also occur here. Back to the robins on a late November day: as their feeding demonstrated, while not edible to humans, birds readily eat the brightly advertised holly and winterberry fruits, especially later in the winter season when other more highly-preferred (read: higher fat content) berries have disappeared. 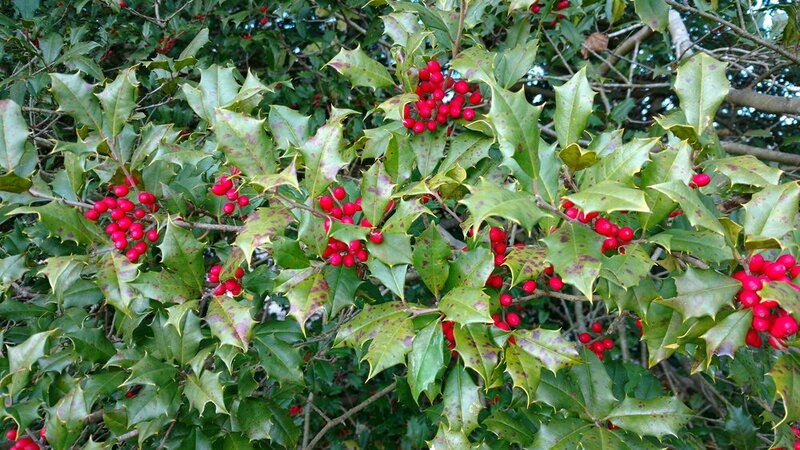 Thus, hollies play a helpful role in keeping nature’s cafeteria open and stocked through the long and cold winter for birds, including robin flocks, that overwinter here on Long Island. Cover photo (holly with frost) by Liz West 2014. All other photos by John Turner 2017.